I noted that no one from J-Street condemned or even distanced themselves from her comments, and wondered why an organization that pretends that it is so concerned about a two-state solution would not say a word against its own speaker advocating a one-state solution with no Jewish state. It turns out that if you parse J-Street’s official position, it is not a whole lot different from Marcia Freedman’s. 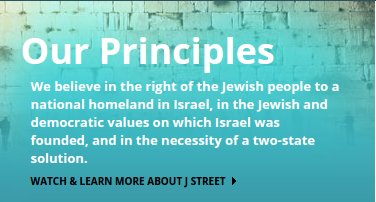 Their six principles also don’t say anything about Israel being a Jewish state. 1. We support the people and the state of Israel and their right to live in security and peace and to defend themselves against those who would harm them. 2. The future of Israel depends on achieving a two-state resolution of the conflict with the Palestinian people. 3. The resolution of the conflict requires serious and sustained US leadership. 4. Israel’s supporters have not only the right but the obligation to speak out when we think the policies or actions of the Israeli government are hurting Israel’s and the Jewish people’s long-term interests. 5. Vibrant and respectful debate about Israel benefits the American Jewish community and Israel. 6. It is both possible and necessary to engage in a warm relationship with Israel and to remain true to the values we hold most dear as Jews and as Americans–and on which Israel was founded. There is very little here that contradict’s Freedman’s solution. If one of the “two states” is not recognized as the Jewish state, then J-Street’s core principles does not preclude the “right of return” – Israel could become a Muslim majority state alongside “Palestine” as a prelude to Freedman’s ultimate goal. To be sure, they will sometimes sprinkle in phrases like “Jewish and democratic state” in their articles, even when they are dead-set against requiring that Israel be recognized as the Jewish state by its “peace partner.” In a final agreement, they say, it would be nice if there was mutual recognition of the rights of the Jewish people to a state along with the rights of the “Palestinian people” to a state – but nothing about recognizing Israel as that state. It is clear that J-Street’s philosophy is far to the left of most American Jews, but they will downplay their true position in order to raise funding for their jihad against Israel’s elected leadership. Members of their college arm, J-Street U, have recognized that as they are frustrated that the J-Street conference was tilted more towards public relations and pretending to represent the Jewish community than towards the “progressive” values they hold dear. Stanford J-Street U members were upset that the Palestinian flag was not on stage at any of the J-Street Conference events, and they were nt happy that J-Street told them to not support divestment from Israel – a position that would be consistent with J-Street’s position of pressuring Israel from without, but one that would alienate its core of clueless liberal Jews who don’t parse J-Street’s positions beyond the “two-state” rhetoric. There isn’t much daylight between J-Street’s real positions and that of Marcia Freedman. And there is a lot of daylight between J-Street’s real positions and what the majority of the American Jewish community desires. J-Street knows that it needs to lie and obfuscate its positions to the Jewish community in its attempts to divide it – and to raise money from it. That is J-Street in a nutshell.